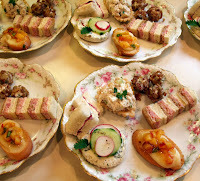 This individual plate of tea sandwiches was served during our recent Queen's Tea. The Domino Ham & Cheese Sandwich is a fun addition to a sandwich plate with its many layers of cheese, ham, and assorted breads. This one looks like a lot of work, but is relatively easy to make. Prepare the ham salad by combining the ham, mayonnaise, and pickle relish. Mix well, set aside. Spread the softened butter evenly on each bread slice. Spread the ham salad on one slice of white bread; top with a slice of wheat bread, butter down. Butter the top of the wheat bread, and place 1 cheese slice on top of wheat bread. Repeat layers with remaining ingredients to form a tall stack. Wrap sandwich in waxed paper; put under a weight, and chill. Note: Any bread slice that comes in contact with the cheese slice needs to be buttered, it acts as the 'glue' that holds the bread and cheese together. Without this 'glue', the sandwich will not stay together. Oh my gosh - I haven't seen domino sandwiches is years. How fun to see them here. I'll have to be sure to make them soon! 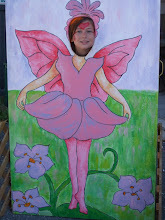 Now that the Tea Blog-a-thon is over, I thought I'd stop by and say hello. Hope you're well! Thanks for the recipe. I will treasure it. What's up, Sebast Here, I like this site I could definitely get absorbed here. What a great idea, thanks!! !